My porch project is taking place upon an existing concrete slab which transfers the cold temperatures in the ground quite efficiently. So, no matter how I heat the room, it would never be able to counter the coldness radiating from the floor unless I chose radiant floor heating which had too many other drawbacks. Thus, I needed a solution. The floor also needed to be raised slightly if I wanted an even flow, or level connectivity, between the existing house and the room. The same applied to the new placement of the patio door. My plans called for carpeting most of the room, plus the addition of some ceramic or porcelain tiling in the corner between the two doors. 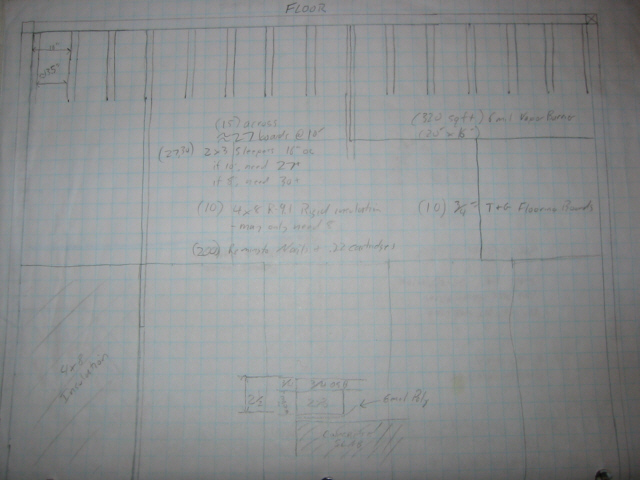 With that information, I calculated out how high the floor needs to be raised with the end surface in mind. That needed to take in account the tile, the tile backer board, the carpet, the padding, the sub floor, and the sub floor support. Laying tile as a floor also has some minimum spanning dimensions for the support in order to assure a minimum amount of deflection in the floor which would otherwise crack your nice tile. Lastly, in order to prevent the cold from seeping through, my plans called for the thickest rigid insulation that could be sit in between the support structure, which turned out to be a nice r9.1 value.